This is the final book in the Grand Tour series. You can read my review of the first two books, Glamorous Illusions and Grave Consequences. Many changes have occurred in the summer that Cora's wealthy biological father claims her and sends her off with his adult children on a grand tour of Europe. In this last installment Cora and Will's relationship is tested and we discover the truth behind the kidnappings. The story takes place in Italy, a setting I loved. This book is not a stand alone but starts up where the second left off. Cora is now an heiress and Will struggles with her new status. Cora too must get used to all the media attention. In addition, even though she claims she loves Will, Pierre de Richelieu does not give up pursuing her. In Tuscany, they meet the beautiful Eleonora who hosts them all at her home. Although Cora becomes fast friends with her, there is some jealousy on her part because Eleonora is attracted to Will too. For the most part, I enjoyed reading how Cora's story ends, which is beautiful. However, I had the same issues with this book as I did with the second one. For one thing, I found it too long. Also, I found Cora came across as preachy and self-righteous at times. She took center stage too often (in a family with status and world renown) and at the expense of the other characters who fizzled in this book, Vivian and Mr. Kensington especially. In the first book, they were both formidable characters. Vivian appeared weak in the second and third books, especially this third book until the very end, and even then I wondered what she was truly feeling when her childhood friend and fiancé did something dreadful. A few things bothered me too. Mr. Kensington (whose friend claims he was a believer of the Almighty God) knows that Andrew has a fiery and abusive character and still he wants him to marry his daughter?? And Andrew's father readily accepted his son's abuse and eventual demise? What happened to Eleonora and her friendship with Cora? Could Cora really manage the mine without her father? How would Cora and Will resolve their career issues? All these questions and more left me unsatisfied, making this book a light read for me and nothing too deep, since issues I felt were important were not dealt with. Overall, this was a trilogy that started off strong but turned into nothing more than a lighthearted Christian romance for me. Now, if you like historical romance and want to escape into beautiful European cities, this will be an enjoyable series. For more reviews, please visit the Litfuse Tour page. 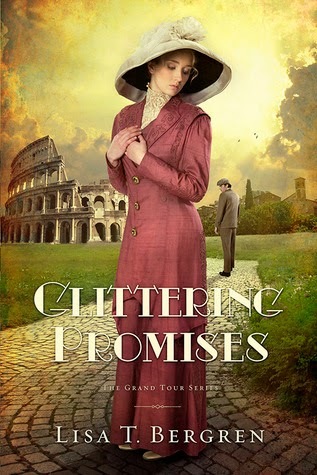 Lisa T. Bergren is celebrating the release of her new book, Glittering Promises, by giving away a $200 Italian feast from Williams-Sonoma and hosting a fun Facebook party on October 29th. Enter today by clicking one of the icons below. But hurry, the giveaway ends on October 29th. Winner will be announced at the "Glittering Promises" Facebook Author Chat Party on October 29th. 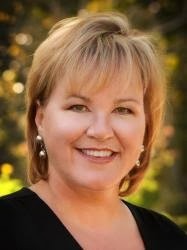 Connect with Lisa for an evening of book chat, European trivia, and prizes, and get an exclusive look Lisa's next book. Don't miss a moment of the fun; RSVP today by clicking JOIN at the event page. Spread the word—tell your friends about the giveaway and party via FACEBOOK or TWITTER. Hope to see you on the 29th!